This story was updated at 3:50 p.m.
A Trump administration official today said a proposal floated by the Energy Department to boost struggling coal and nuclear plants is faltering at the White House after failing to attract support. "Efforts to ensure resilience of the grid continue while DOE's poorly articulated policy flounders in the National Economic Council," said the official, who requested anonymity because the person was not cleared to speak for the White House in an official capacity, when asked about a DOE draft proposal underpinning the White House review. Barring an unexpected resolution, the White House opposition prevents President Trump from delivering on part of a pledge to help Appalachia's coal miners before the midterm elections. The language in question stems from a draft DOE document that leaked to the media earlier this year after making its way around the National Security Council. 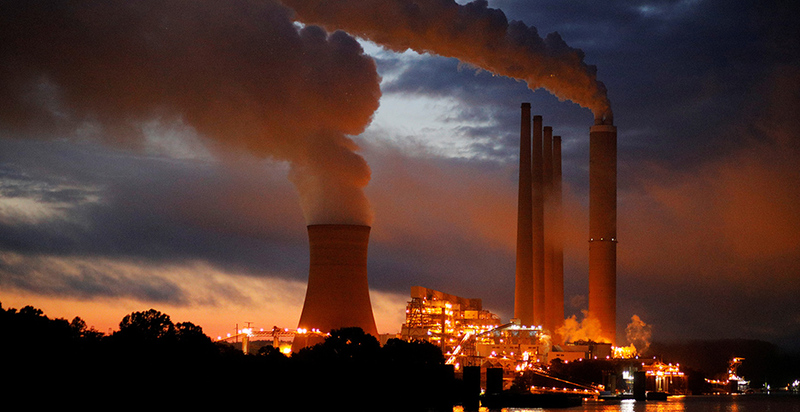 The "pre-decisional" document proposed purchasing electricity from unidentified U.S. coal and nuclear power plants to prevent their "premature" retirement, citing heightened threats of cyberattacks and natural disasters. The language pulled from three statutes: the Defense Production Act of 1950, Fixing America's Surface Transportation (FAST) Act of 2015 and Energy Policy Act. Those purchases would serve as a stopgap defense for two years while DOE completed a detailed assessment of strategic vulnerabilities and interdependencies among electricity, natural gas and other critical infrastructure. The policy was quickly denounced outside the White House by free-market conservative think tanks and a coalition of oil, gas, wind and renewable power interests as a "bailout." Inside the administration, the agency's "pre-decisional" draft has faced a slew of questions about legal authority from Don McGahn, the outgoing director of the White House Office of General Counsel, as well as stiff pushback from the National Economic Council, led by Washington insider Larry Kudlow, according to sources (Greenwire, Aug. 22). Since last year, Energy Secretary Rick Perry — responding to direct instructions from Trump — has unsuccessfully sought ways to slow the retirement of coal and nuclear plants. White House spokeswoman Sarah Huckabee Sanders earlier this year said that Trump had directed Perry to prepare "immediate steps" to halt the loss of "fuel-secure power facilities" and that the president was looking forward to Perry's recommendations. That directive stemmed from a commitment he made early in his administration to two top coal and nuclear executives, according to his staunch supporter Bob Murray, CEO of Murray Energy Corp. (Energywire, Aug. 23, 2017). Murray in a statement noted Trump has repeatedly directed members of his administration to enact measures to protect the grid's reliability, resilience and fuel security before warning about over-reliance on natural gas. "We have a problem in our nation — the very plants needed to provide low-cost, resilient and reliable electricity are closing fast and will never come back," said Cody Nett, a spokesman for Murray. "That will leave our country with one fuel source — a fuel source that has supply delivery problems, as evidenced by the recent gas explosions, and, according to EIA, is at the lowest level of winter storage since 2005." Politico first reported that the policy had been shelved. Trump has made his personal investment in boosting coal and nuclear known, referring to the policy as a "military plan" at a West Virginia rally this summer. "You know what you can't hurt? Coal," Trump said from his podium at the rally to applause. "We're working now on a military plan that's going be something very special." The president's order for Perry to help the coal and nuclear sectors sent DOE's policy team in search of a rationale to justify federal intervention in the nation's electricity market, confronting powerful economic and competitive trends. Chief among these was the game-changing surge in natural gas reserves opened to production by hydraulic fracturing technologies, particularly in the eastern U.S. and Texas, where older coal plants were particularly vulnerable. Prices for solar electricity have been on a steady decline for a decade. The capacity of wind turbines has also been marching ahead. And overall demand for power across the U.S. had slowed to an anemic 1 percent growth rate or less, leaving too many power plants chasing a slow-growing market. Responding to their customers, an increasing number of power companies said they were on a path to reduce dependence on fossil fuels in favor of cleaner energy options. An example of this shift is American Electric Power, based in Columbus, Ohio, whose CEO, Nick Akins, said in June that coal generation would drop to 33 percent in the next decade from 70 percent in 2005. Coal units have to earn the right to keep operating with their performance, he said. If they don't, "then we'll shut 'em down," Akins said (Energywire, Aug. 21). In the Southeast, major utilities, including Atlanta-based Southern Co., are moving to a low- or no-carbon fleet. Last year, Perry commissioned a policy analysis on the impact of coal and nuclear retirements on power grid "resilience," and his top aides used that as ammunition for a petition to the Federal Energy Regulatory Commission to intervene on behalf of money-losing generators in those sectors. FERC rejected the DOE move by a 5-0 vote in January. The commission then invited comments on whether new approaches were needed to defend power grids against extreme human threats and natural disasters. Rather than wait for FERC, Perry's policy team focused on a "national defense" case for subsidizing struggling coal and nuclear plants. The coal and nuclear units' "on-site" supplies of fuel made them more secure and resilient to disaster than gas-fired generation, whose "just-in-time" fuel had to travel over long-distance pipelines, DOE said. Details of an unapproved DOE policy draft leaked in June, setting off a furious counterattack by a rare coalition of allies — gas, oil and renewable energy producers and energy market and energy efficiency advocates. The opponents began work on legal challenges in case the policy become official. Critics mocked what they said was the bankrupt logic of a generalized plan to subsidize aging coal and nuclear plants whose energy wasn't required. Grid operators like PJM Interconnection and ISO New England said fixing specific resilience issues on a case-by-case basis was the right strategy and asked FERC for more authority to do that rather than the blanket approach in the leaked DOE document. Last month, Perry acknowledged the issue was out of his hands. "I don't have anything new to report from four or five months ago. It's still being talked about, it's still being bandied around the White House," he told reporters (Energywire, Sept. 27). "We've given them all the information that we have, showed them where the potential for challenges are, and we're waiting for them to make a decision as to which direction they want to go," he said. Asked whether DOE's work is done on the resilience issue and identifying power plants for possible support, Perry replied, "Pretty much." Reporters Rod Kuckro and Peter Behr contributed.